Corps of Engineers. Finally, amidst a groundswell of demands from all sectors of the economy for drought relief, you have stood alone in refus- ing to turn to the federal treasury to 44 solve your hardship," the Secretary wrote. Engineers to dredge out bottle- necks. National media attention riv- eted on the industry's plight. All of a sudden, the low-profile barge and towing industry on the inland wa- terways was in an extraordinary struggle with nature, and doing so on network television. For a brief period last summer, the Drought of '88 choked some of the key arteries of water commerce. The Corps of Engineers worked hard. The Coast Guard worked hard. The barge industry worked hard. However, there was little coor- dination. The three entities re- mained organized for normal opera- tions, not the rapidly unfolding cri- sis. This is the story of how this very bad situation got very much better. Force to examine using diverted water from the Great Lakes to raise the level on the Illinois Waterway and the lower Mississippi, "so that a national catastrophe can be av- erted," should the drought deterio- rate to that crisis point. AWO re- ceived coverage on network televi- sion and in major newspapers for its proposal. 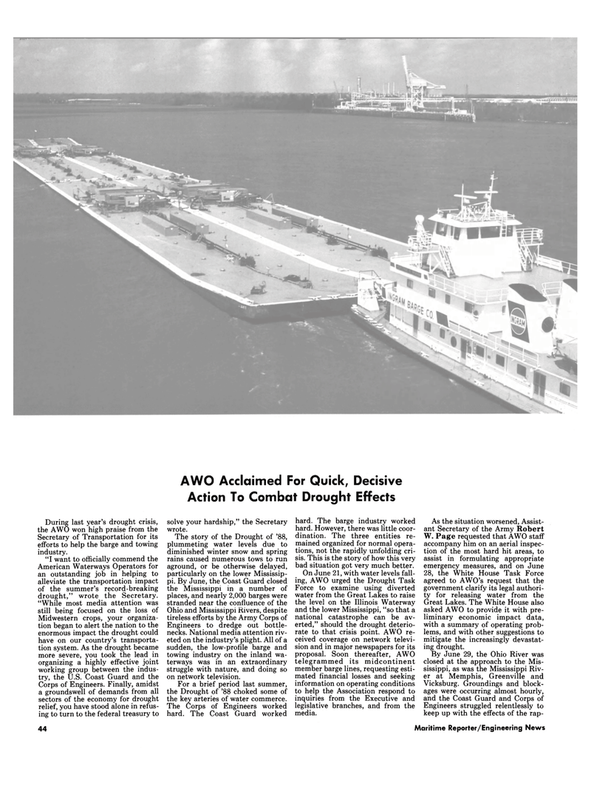 Soon thereafter, AWO telegrammed its midcontinent member barge lines, requesting esti- mated financial losses and seeking information on operating conditions to help the Association respond to inquiries from the Executive and legislative branches, and from the media. Great Lakes. The White House also asked AWO to provide it with pre- liminary economic impact data, with a summary of operating prob- lems, and with other suggestions to mitigate the increasingly devastat- ing drought.